The picture didn't do it justice. This is an amazing loaf/bread/slice. You can't tell there is pumpkin in it. Just tastes like a piece of DELICIOUS chocolate cake. Totally healthy, legal, full-of-super-foods chocolate cake. When I get to eat this I even love being on the Candida cleanse. Okay............maybe love is too strong of a word. Its better than being in prison or being poked with a sharp stick. This loaf is helping me survive the strict phase of Candida. I haven't had a bite of grains, fruit, yeast, vinegar, etc, etc. etc. 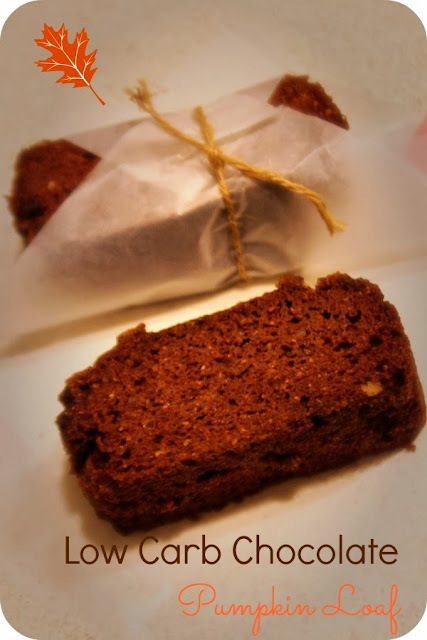 But I have had lots of bites of this (and my chocolate zucchini macaroon loaf - that one is delish too). And that's perfectly okay. Its totally legal. Make a double batch - slice, wrap, freeze - and then grab and go! And when that sugar craving hits you have something to keep your brain happy even while starving those sugar loving Candida beasts. Win! Grease a standard size loaf ban and then line with parchment paper. And wet ingredients to dry ingredients and stir until fully combined. Pour into loaf pan and let stand 10 minutes before putting in the oven. Bake for approx 50 - 60 minutes. This looks wonderful and I cannot wait to try the recipe. Thanks for providing it!